I must stop eating cupcakes. Do you have this problem too? If so, let’s practice the art of resistance together. It’ll be fun! Sort of like a club. Except I’m not giving out fancy membership cards. Sorry to let you down like that. Seriously though! Not baking is hard when you are an addict. I need a support group. Maybe we could be friends on Facebook, or we could follow each other on Twitter? Social network support groups for baking addicts would be totally acceptable. 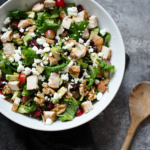 Healthy things would happen more often in the kitchen. 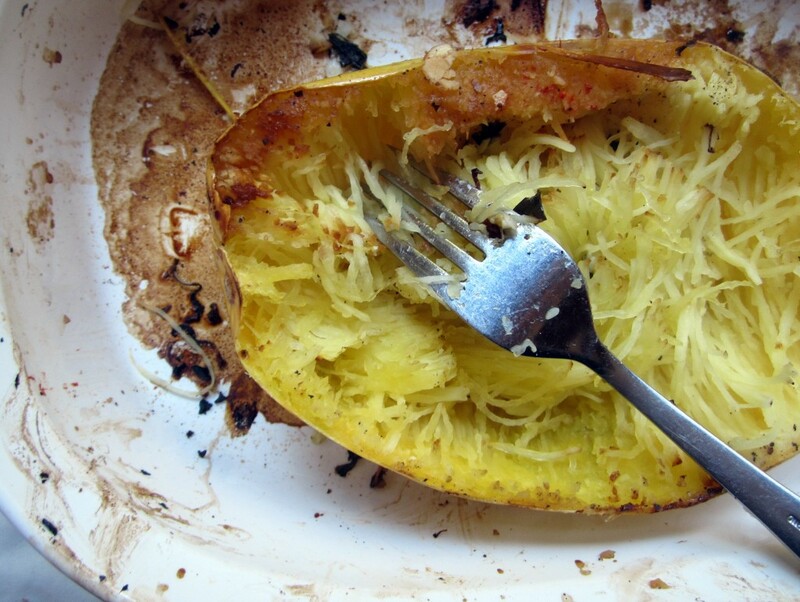 I’d probably roast spaghetti squash every day instead of eating pasta. I’d do 100 squats while watching Project runway. I’d park my car far away just so I could walk more. I’d do that P90x junk. I’d stop eating all my creations. Even plain baked apples would be considered dessert. Such healthy people we’d be! I do make healthy creations about 80 percent of the time. 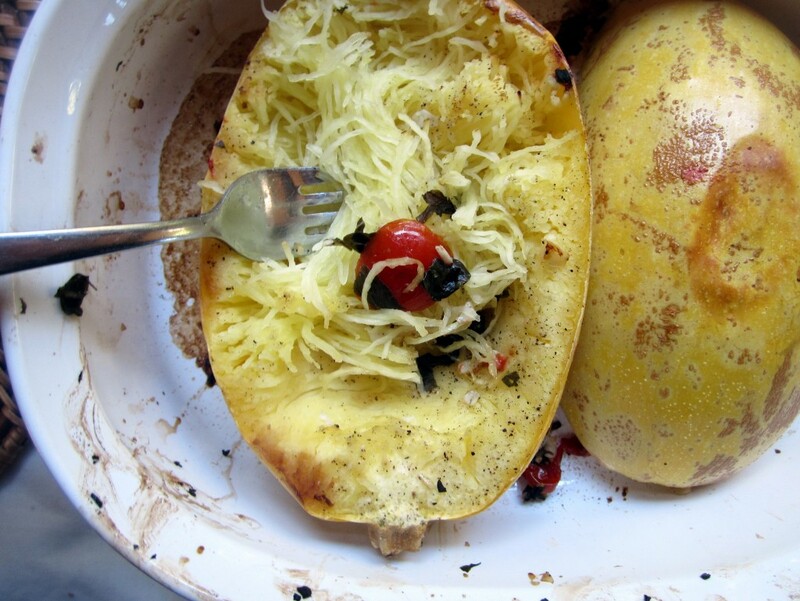 Amazingly better than pasta, spaghetti squash is very low in calories. 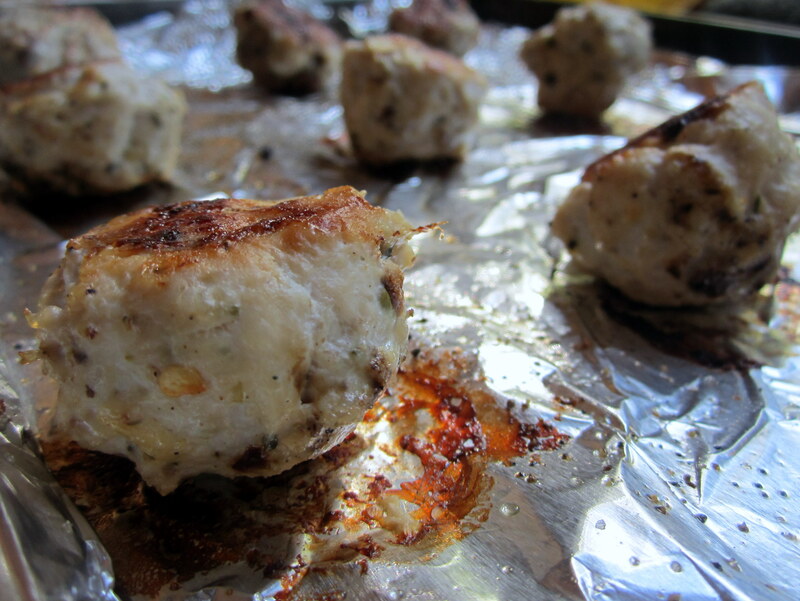 Add in lean protein with some tasty Goat Cheese stuffed Chicken Meatballs. I do like meatballs. A lot. Add in Basil Gremolata, tomatoes, and sautéed zucchini. Sprinkle in a little salt and pepper. Stir til pretty! 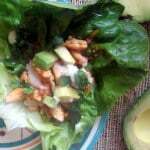 Enjoy a low-calorie meal. Sharing optional, obviously. 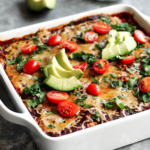 Do you have questions about cooking or baking healthier? I’d love to answer them. You can read my article on Easy Substitutes for Healthy Baking over at The Bakery Spot, and feel free to contact with any questions or comments! Please note: if you are trying to resist baking, do not turn on Cupcake Wars after you make this like I did. Because back to baking you’ll go. Line baking pan with foil and spray with cooking spray. 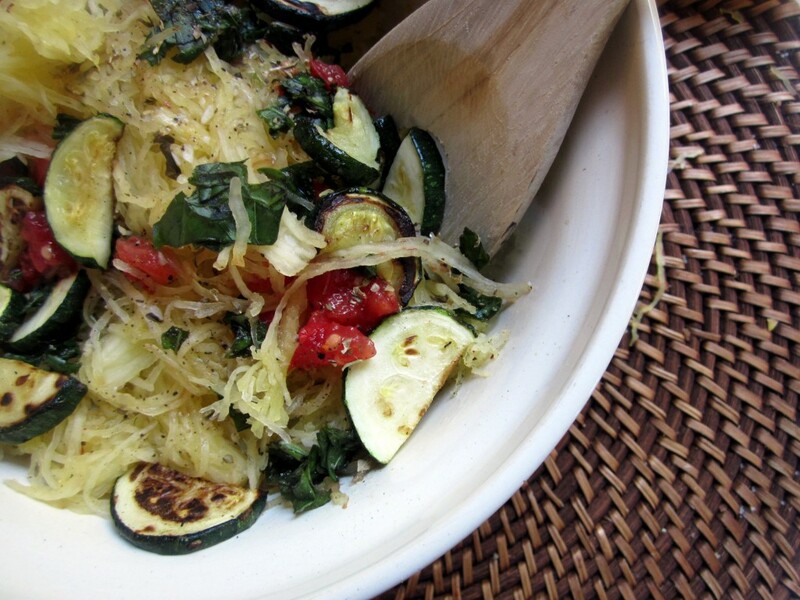 Cut spaghetti squash in half and drizzle with 1 tsp of olive oil. Place face cut side down in pan. Bake for about an hour then remove and cool 10 minutes before forking. 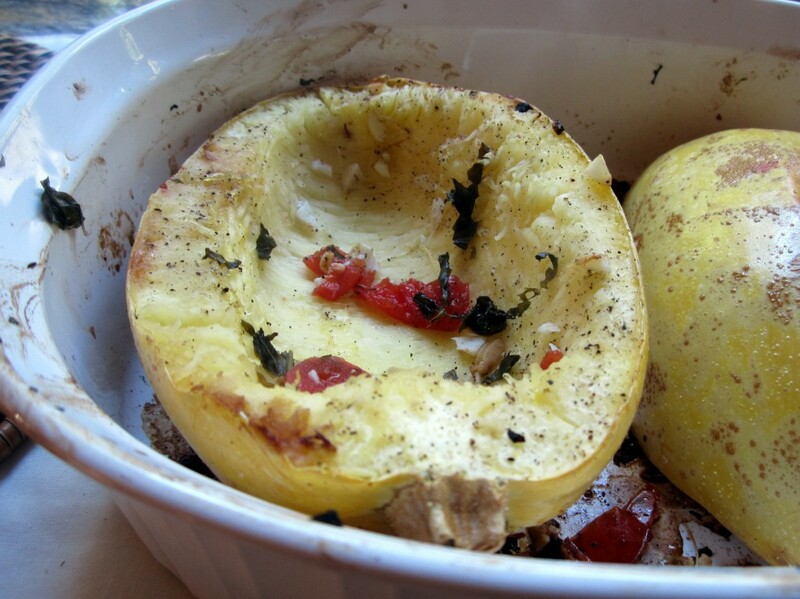 While spaghetti squash is baking make your basil gremolata: Put garlic, 2 tsp olive oil, salt, and some fresh black pepper into a small bowl and smash into a paste. Add chopped basil, lemon zest, lemon juice to bowl and stir. Set aside. 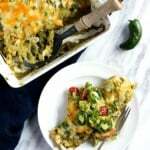 In small nonstick frying pan, add zucchini and tomato and saute until zucchini is golden brown. Sprinkle with a dash of salt and black pepper and remove from heat. Set aside. Put foil on top of baking sheet and spray with cooking spray. Combine the chicken, egg white, breadcrumbs, garlic, spices, oregano, basil, salt and pepper in large bowl; mixing well. Form mixture into about 12 meatballs,2 inches round. Place a piece of goat cheese into the center of each meatball and push in. Place on prepared baking sheet. 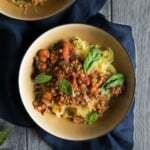 Once you remove spaghetti squash from oven, place meatballs into oven still at 400 degrees F for about 17-19 minutes, or until juices run clear. Gently fork your spaghetti squash after a bit cool and place into large bowl. Add your basil gremolata. Then add your sautéed zucchini and tomatoes. Stir. Sprinkle salt and pepper to taste. 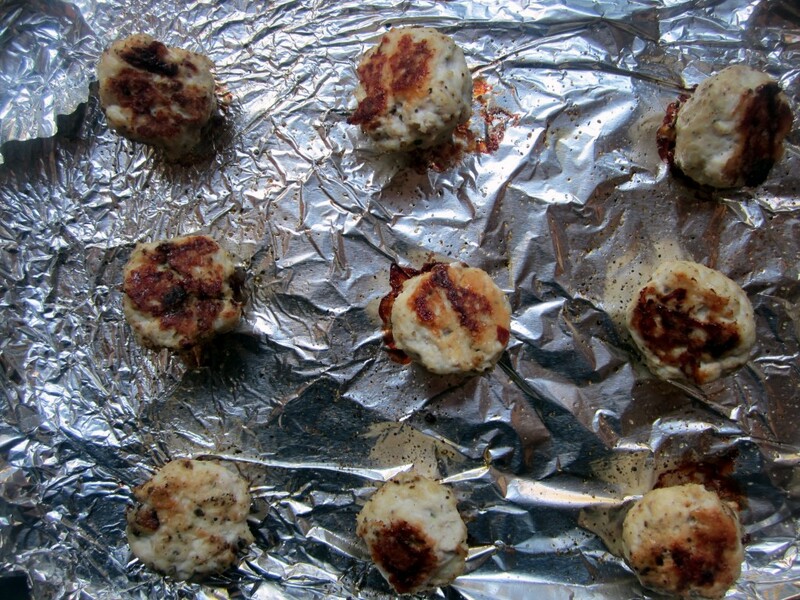 Place chicken meatballs on top and serve immediately warm. 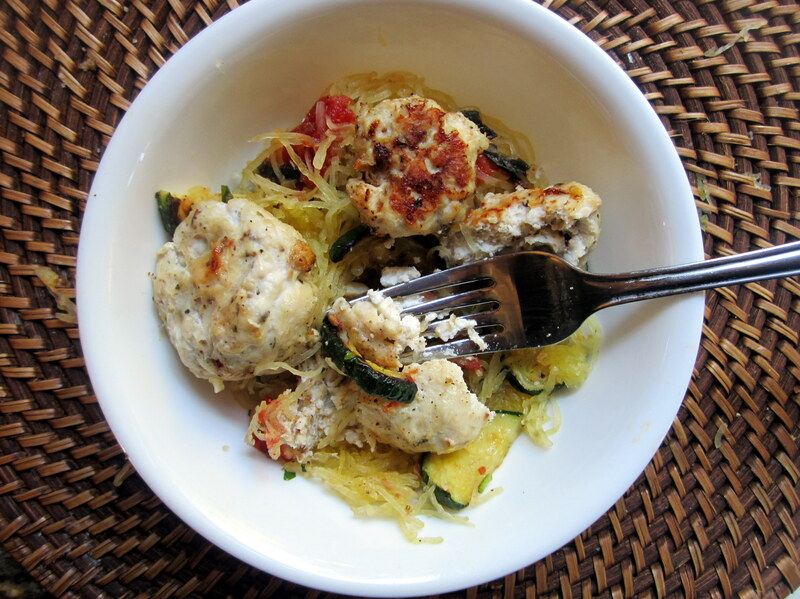 7 Responses to "Goat Cheese Stuffed Chicken Meatballs with Spaghetti Squash & Basil Gremolata Salad"
Delicious! Just made this for our anniversary dinner. New to your site and loving it! I am literally making the spaghetti squash recipe right now but I forgot to get Basil!!! I hope it’s still good! This was delicious! 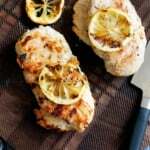 So light and tasty: perfect for a summer night! This was an awesome awesome recipe!!!! 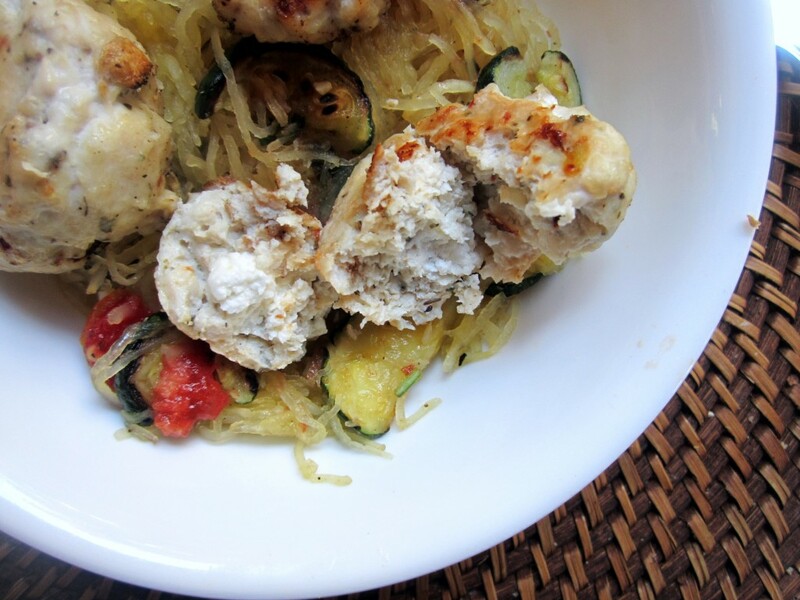 My boyfriend hates goat cheese and spaghetti squash, so I tried this and he ate all of it & more. Definitely a recipe I will be sharing with others! I am new to your site. 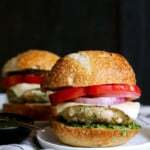 A friend recommended this recipe! Absolutely delicious. I am now scrolling the 400 and under recipes for my next meal!